We encourage you to post your questions for your peers and to answer other members' English language questions. Explaining something you have understood to another community member is one of the best ways of checking and consolidating your own understanding of it. Your answers are regularly checked by a teacher who chooses the best answer. If your answer is designated as an 'excellent answer', you are awarded a certain number of credits. We would love to hear from you. Use this forum to leave feedback for us about the different features of our online English course and the contents of the lessons. Also, feel free to suggest language topics that you would like to see reviewed or expanded on in future video lessons. 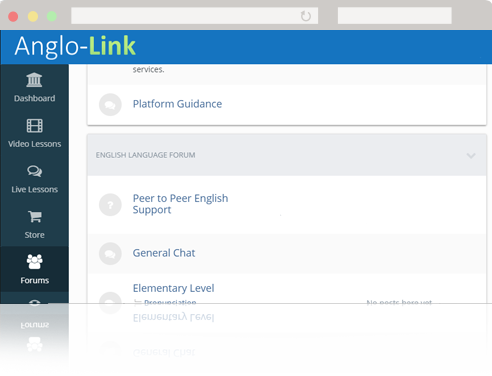 If you would like to send your question directly to an Anglo-Link teacher instead of posting it on the forum, you can open a ticket for us. If you have any questions about the features, or if you need help using the platform, you are welcome to open a ticket for the technical / sales team.